Softcover, 132 pages, illustrated with black and white photographs. 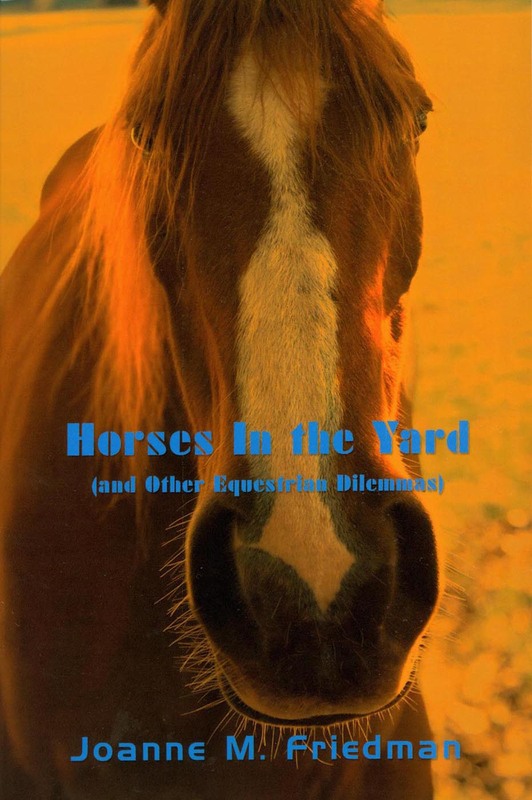 Horsewomen of all ages will enjoy this book. If you ever couldn't find words to express something (or thought better of it if you did) Joanne Friedman has done it for you - with great humor and eloquence. She doesn't mince words about anything - from horse care - to equitation - to aging and euthanasia. "Women are built differently than men, and I am not talking obvious body parts. A man's center of gravity is in his upper torso. That's why Christopher Reeve toppled so disastrously from his horse and was lawn-darted into a rock wall. A man's weight is in his chest. A woman's on the other hand, is in her (sorry) hindquarters. This is a good thing for riding's sake as it allows a woman to ground significantly more thoroughly in the saddle than a man can.... A woman who can imagine being a half-empty (or half-full, depending on her level of optimism) sack of grain can sit in a saddle with a security and balance few men can achieve..."
"We treat our horses like we treat our children: we load them up with expectations, then we withhold the tools they need to fulfill them. The kids go off and do drugs and get pregnant, and we blame anyone who can't get out of the way fast enough. The horses buck us off and become hard to catch in the field, and we curse our bad luck at having wound up with such an incorrigible beast. They're all yelling at us, and we're not listening." How should you prepare your horse? Well, you can start by going out and getting him from the field before the farrier gets there. Don't leave notes with instructions as to where Loopy Lou can be found. Go find her yourself. Have her reasonably clean and dry and standing in a stall or nearby pen in plenty of time. Many shoers will not hesitate to go look for your horse, but it's a kindness to everyone involved if he doesn't have to. Besides, there are not enough horse shoers as it is. We don't need to be wearing out the ones we've got." If Joanne's wit is not enough - one chapter (chapter 10) is worth the price of the whole book. "The Five Horses We Meet on Earth" categorizes each horse you've encountered (and will encounter) in such a profound way - your perspective on horse ownership will be changed forever. Wow. I don't think I've ever read anything that is so deep - and light-hearted at the same time.